In 1969, no one thought that a skinny Asian man could become one of the most influential people in modern history; that was Bruce Lee. 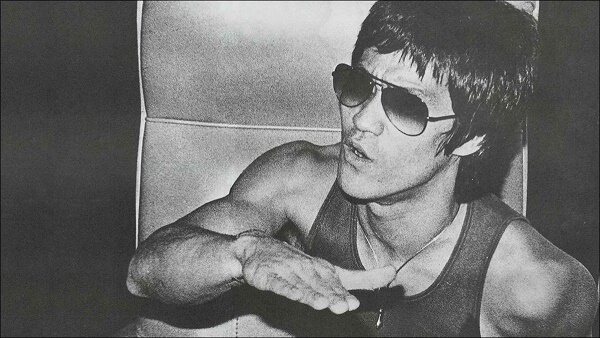 Named by TIME magazine as one of the 100 most influential personalities of the 20th century as well as the first person to ever be inducted into the hall of fame of martial arts, Bruce Lee used to be a man light years ahead of his time.In fact, he also was light years ahead of our time. Bruce Lee was much more than just an actor, or a martial artist with a charismatic personality. He was a deep thinker and a philosopher. Not just for his thought-provoking outlook on life, but also for his ability to prove his philosophy through demonstrate tangible results. It is extremely rare for anybody to manage to accomplish their physical, mental and spiritual being. Bruce Lee succeeded them all while he was still very young. Four years after writing this mysterious letter, this amazing human being was found dead. However, during these four years, Bruce achieved all of his stated goals and more. Actually, Bruce made a revolution in martial arts, which is the reason why the president of the UFC calls him the father of mixed martial arts. Nevertheless, even more profound than this distinction is the fact that Bruce Lee contributed in changing the world’s perception of the entire Chinese race. Before Bruce’s entry into Hollywood, Chinese people were broadly portrayed in a humiliating and degrading light. For several decades China was massively called as the “sick man of Asia” as the Western powers and Japanese elite invaded and almost destroyed the country during the Opium Wars. That had a dreadful impact on the Chinese people, who were broadly relegated to a state of servitude and helplessness. However, Bruce helped to change that concept once and for all and replaced this disempowering stereotype with the idea of martial arts and strength. A colossal feat that is frequently overlooked. SO HOW DID BRUCE LEE KNOW HE WAS GOING TO DO THIS? There are two ways of making a good living, one is the result of hard working, and the other, the result of the imagination (requires work, too, of course). It is a fact that labor and thrift produce a competence, but fortune, in the sense of wealth, is the reward of the man who can think of something that hasn’t been thought of before. In every industry, in every profession, ideas are what America is looking for. Ideas have made America what she is, and one good idea will make a man what he wants to be. One part of my life is gung fu. This art influences me greatly in the formation of my character and ideas. I practice gung fu as a physical culture, a form of mental training, a method of self-defense, and a way of life. Gung fu is the best of all martial art; yet the Chinese derivatives of judo and karate, which are only basics of gung fu, are flourishing all over the US. This so happens because no one has heard of this supreme art; also there are no competent instructors… I believe my long years of practice back up my title to become the first instructor of this movement. There are yet long years ahead of me to polish my techniques and character. My aim, therefore, is to establish a first Gung Fu Institute that will later spread out all over the US (I have set up a time limit of 10 to 15 years to complete the whole project). My reason in doing this is not the sole objective of making money. The motives are many and among them are: I like to let the world know about the greatness of this Chinese art; I enjoy teaching and helping people; I like to have a well-to-do home for my family; I like to originate something; and the last but yet one of the important is because gung fu is part of myself. Before he passed away, some asked the late Dr Charles P. Steimetz, the electrical genius, in his opinion “What branch of science would make the most progress in the next twenty-five years?” He paused and thought for several minutes then like a flash replied, “spiritual realization.” When a man comes to a conscious vital realization of those great spiritual forces within himself and begins to use those forces in science, in business and in life, his progress in the future will be unparalleled. I feel I have this great creative and spiritual force within me that is greater than faith, greater than ambition, greater than confidence, greater than determination, greater than vision. It is all these combined. My brain becomes magnetized with this dominant force which I hold in my hand. When you drop a pebble into a pool of water, the pebble starts a series of ripples that expand until they encompass the whole pool. This is exactly what will happen when I give my ideas a definite plan of action. Right now, I can project my thoughts into the future, I can see ahead of me. I dream (remember that practical dreamers never quit). I may now own nothing but a little place down in basement, but once my imagination has got up to a full head of steam, I can see painted on a canvas of my mind a picture of a fine, big five or six story Gung Fu Institute with branches all over the States. I am not easily discouraged, readily visualize myself as overcoming obstacles, winning out over setbacks, achieving “impossible” objectives. 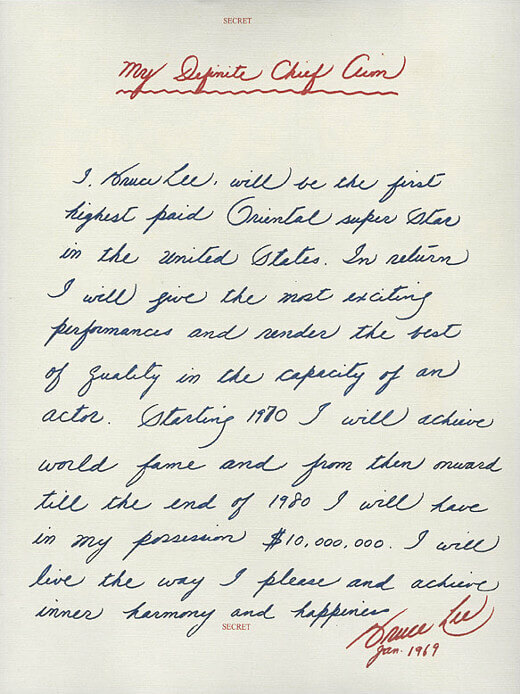 Thinking that Bruce Lee was just 21 years old when he wrote this letter, it’s completely mind blowing. Regardless of his age, the content is incredibly thoughtful. What we learn by that is Bruce was living in a basement at the time but already knew that there was something inside him infinitely more powerful than his current situation, which he mentioned as a “great creative and spiritual force within” him. It's been this force, along with the following principles, which contributed in his incredible accomplishments. As it has been declared, if you can come up with a profound reason why you want to accomplish your goal in life — and then keep it in mind — you can go on almost any how. Bruce laid out his reasons why; citing his passion for martial arts, his conviction to help other people, his need to improve the lives of his loved ones, and his deep desire to share a part of himself with the world. Bruce made it crystal clear that he did not only care for “the sole objective of making money,” but he was passionate about his goals. When we chase something that we are passionate about, something that really makes us feel alive; not only are we willing to work seven days a week, 365 days a year for it (which drastically improves our opportunities at becoming successful), but it also provides us with a sense of purpose, and this is profoundly satisfying for us, something that money cannot ever buy. We usually limit ourselves by thinking logically about our circumstances or situation, and this discourages us. Imagine you were living in a basement like Bruce was, and then you made the claim that you were going to change the world. It'd be one of the craziest things you could do. However, rather than thinking rationally, Bruce had come to conclude that he had a great power inside him that could lift him out of his situation. You can call this force, willpower, spiritual force (as Bruce did), determination, or whatever you prefer, but it exists and has been demonstrated many times by various personalities throughout history. Realizing that you can access it, will help you get over that which seems “impossible”. Any issue we may face in life, somebody has already faced before us and written a book on it. If we want to begin our own company, somebody has written a book on that. If we want to get over our depression, somebody has written a book on that. If we want to overcome poverty, somebody has written a book on that. If we want to understand the power of thinking, somebody has written a book on that. Bruce Lee is a man who understood the power of reading and self-education well. In fact, when he was 32 years old, he used to have a personal library that's said to have contained well more than 2,500 books. Amongst this impressive list, it included famous readings on the power of the imagination, for example, Think and Grow Rich, The Power Of Positive Thinking, and As a Man Thinketh, among others. These readings certainly had a massive influence on him. 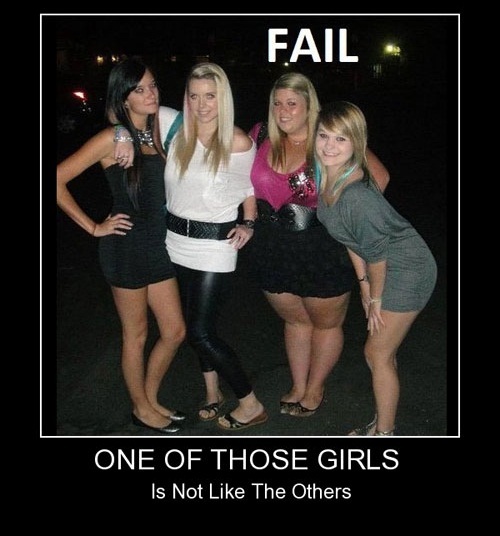 Confidence is not what the majority of people think it is. Confidence is the determined belief — and commitment — that no matter what obstacles we might face in life, and no matter how many times we may fail, nothing and nobody is going to be able to stop us from accessing our goal. Bruce had this confidence in himself and made up his mind, which although he might be living in a basement right now, and although he might meet with failure, he will never stop. And he will do whatever is required to accomplish his goals.